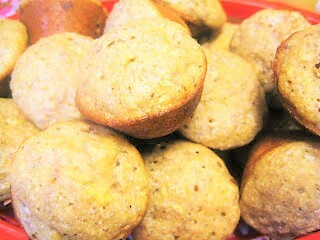 Three whole grains, and low sugar, makes these muffins a great start to your day! They have more of a lightly apple sweetened taste than the "nearly a cupcake" taste that commercial muffins have! This recipe was handed down to me by my late Grandmother, Phyllis. I love that it is both nutritious and delicious! I made mine into mini muffins because, my kids love when I pre-bag 4 -5 of them in sandwich baggies for them to grab and go out the door in the mornings. Jan's Tip: I substituted apple sauce for the oil in the recipe. You could also substitute pumpkin puree and that would be a great substitute also. Jan's Tip #2: Did you know that ice cube trays hold about 2 Tablespoons in each Cube Slot and is perfect for freezing Pumpkin Puree or even applesauce? Once frozen just pop them out and into ziplock baggies and store in freezer till you want to use them in recipes. Since they are pre-measured into 2 Tablespoon increments, you can just pull out what you need, microwave to thaw and bammo, ready to roll! 4 Tablespoons (2 cubes) = 1/4 cup. Heat oven to 375 degree's. Spray non stick spray in muffin tins or line with paper liners. Combine dry ingredients, add milk, oil,and eggs, mixing until just moistented. Stir in apples. Fill cups almost full. Bake 16-18 minutes or until light golden brown.